When deciding on a place to go for dinner a friend and I referenced the restaurant list I’ve compiled of places around Madison I want to try out. They consist of personal recommendations, restaurants that have had good reviews, and traditional Madison favorites. The list started off pretty large about 5 years ago and has dwindled to 11 places. One of those places was Eldorado Grill. I’m a huge fan of Food Fight restaurants which is why this one has been on the list for awhile. My favorite restaurant in Madison is Monty’s Blueplate Diner, which is owned by Food Fight. Other favorites include Bluephies, Hubbard Avenue Diner, Fresco, Bluephies Downtown Deli, Tex Tubb’s and Ocean Grille (even though the decor is this odd Las Vegas style nautical look). So when we decided to go I was pretty excited because it is one of the last Food Fight restaurants I haven’t been to. The menu looked pretty promising with a mixture of tex-mex favorites and traditional steakhouse options. When we got there I was very impressed with the location. It is nestled next to Ground Zero coffee at the tip of Willy Street in the old Madison Candy Company building. The restaurant was a lot smaller than I was expecting but the decor was fun with tequila bottles lining the ceiling and horseshoes on the walls. We decided to start with the chips and salsa because in my opinion you can tell the quality of a tex-mex restaurant based on the quality of their chips and the flavor of their salsa. The waiter brought over a very large portion of chips and salsa but to my dismay the salsa was slightly acidic and heavily seasoned with cumin. I didn’t get any of the flavors I would normally like to taste in salsa like garlic, tomato, onion, or jalapeno. The chips were hot and crunchy but lacked any hint of salt. After our fair share of chips and salsa both of us decided to order an appetizer because the entrees that were coming out of the kitchen door looked enormous. I got the tamales and my dinner companion got chiles con queso. I also got a cup of the house chili, which was a very heavy texas chili that could have used some sour cream to cut through the smokey pepper flavor. I couldn’t taste anything but the smoke which was disappointing because the rest of the ingredients (beef tips and an array of peppers) sounded promising. The highlight of the chili was the small half circle piece of corn cake I got. It was a delicious little pancake with the traditional sweet and savory flavors of really good corn bread that I can never seem to replicate at home! My entree came out on a huge plate and was beautifully arranged but that was the end of good news for my entree. The tamales consisted of an inch of corn masa and a couple slivers of pork. The pork that I could find was very moist but didn’t have any flavor. The black beans were also flavorless other than the very small dollop of roasted corn that was very tasty. The salsa verde was vinegary and I was hoping for some spice and garlic but all I got was cilantro. The food was by no means bad, I was just expecting more flavor and spice. 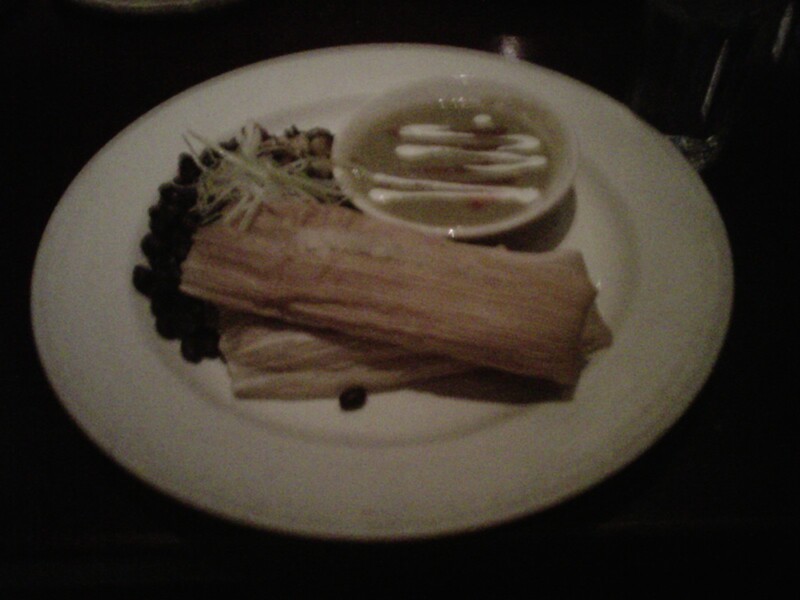 It really needed some flavor on the black beans, some spice in the salsa verde, and more pork in the tamales. I would have also liked something cool to balance out the temperature from the steaming tamales. Some sour cream or fresh avocado would have cut through the heaviness of the corn masa very nicely. My friend got the chiles con queso which came in a little cast iron pan and was bubbling with cheesy goodness. She also got a little bowl of flour tortillas to presumably make her own tacos. However, the cheese was so thick that the making of the tacos was almost impossible. I tried a bit of her chiles con queso with some of my leftover corn masa and it was very good. The smokiness of the peppers were just right and the cheese cut through the dry corn masa very well! So basically my appetizer combined with hers would have been a good dinner to share because both of our meals were missing components that would have really added to the dishes. Bottom line: This is the first Food Fight restaurant that has disappointed me but because it is a Food Fight restaurant I will definitely be going back to give it another try. My meal was alright but could have been a lot better with a couple very simple changes like garlic, avocado and a little bit of jalapeno. I loved the atmosphere and am going to give one of their entrees a try next time!